The Family Panel aren't just the Tots, 20somethingmum and Gadget Dad- we have a big extended family too. So buying gifts for Christmas can be a mindfield. Some are easy to buy for, but some, like Teen Niece and Middle Sister are just that little bit more hard to provide for. We've been looking at some more online sites to see what we can find.. Teen Niece is 15. She likes things a little bit different, isn't massively fashion conscientious and has a love of quirky items you cant buy on the High Street. That could prove expensive, but not with Temporary:Secretary. 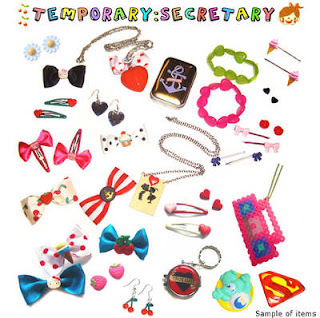 Temporary:Secretary is an online only boutique, in their words selling cute, quirky, vintage and kitsch handmade jewellery. When you see some of the designs on offer, it'll be no surprise that they've already been featured in every fashion spread from Heat magazine, to Mizz, to The Telegraph online, and have graced such trend setters as Fearne Cotton and Peaches Geldof. 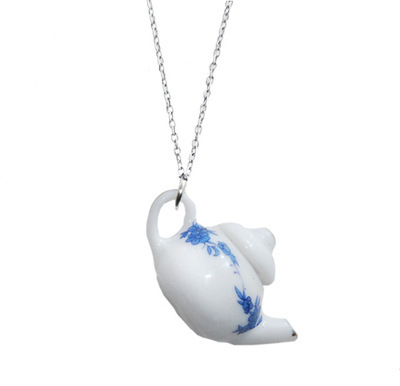 If you love the off beat style of Lady Ga Ga (and what teen girl doesn't), you can provide a toned down version of her Teapot love- Temporary:Secretary stocks gold link chains which have a mini china teapot on the end! There are also some amazing rings too, these aren't just a classic cocktail or costume jewellery piece of identikit high street bling. 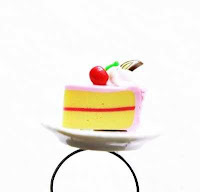 No, there are amazing flower nests which are eye catching, mini cream cakes (yes really) and camera rings for those with paparazzi aspirations, yet they are not too bulky as to be uncomfortable and are really surprisingly inexpensive. Love hair slides? Well there are a range from the sublime to the ridiculous on site too, all at affordable prices starting at £2. 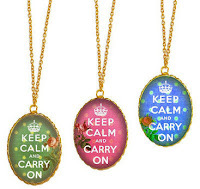 And for the young at heart, why not wear the Mum's favourite slogan on a gorgeous necklace- with a Keep Calm and Carry on Logo dangling from it! I personally love this and have been giving more than a few hints at Gadget Dad for Christmas! You name the type or style you're looking for, and it'll be found here, I am in love with this site and only wish it had existed in my more "style care free" days as a teen myself! What do you buy for someone who has no need for slippers, not a lover of chocs, and tells you they don't really want anything? You buy a gift that they wont forget in a hurry! The Designer Toilet Roll Company sells just that sort of present, and wont fail to provide a gift which will become the talking point of Christmas Day for years afterwards! The company themselves, started by Natasha Meredith in 2009, explain that they wanted to provide a way of putting an impressive finishing touch to bathrooms and cloakrooms, as buying 2ply toilet tissue doesn't need to mean boring standard colours! For me, this is something that unless you really are very style concious will be a great fun buy, and the Toilet roll really did give Gadget Dad a giggle when it arrived. One friend said they thought they'd feel bad for using it in the loo! The site sells the tissue in packs of 3, for £8.95, and stocks Simon Cowell's favourite black rolls as well as heavily patterned rolls and a variety of colours not available in the supermarket. They also stock kitchen rolls, luxury hand towels and care products, as well room fragrances and gift vouchers too. For the person who you literally cannot think what to buy for, this is a quirky gift indeed!